Hills For Everyone is the fiscal sponsor for the neighborhood group, Protect Our Homes and Hills (POHAH). POHAH signed a settlement agreement in August 2016 with the developer of the Cielo Vista project (North County BRS) and will not oppose its housing project due to the additional concessions offered. 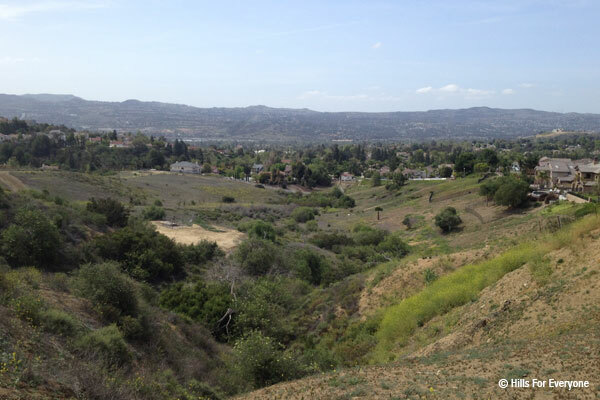 As of November 2018, the project applicant is working with the City of Yorba Linda on a pre-annexation agreement. The project received its first set of approvals at the Board of Supervisors on December 13, 2016 and final approvals September 12, 2017. The project applicant presented “Alternative 5” to the Orange County Planning Commission on March 9, 2016. The Final Environmental Impact Report (FEIR) was released November 18, 2015. The County of Orange has received comments on the Draft Environmental Impact Report (EIR) in January 2014. The original Cielo Vista project proposed 112 dwelling units on 87 acres. The project has a new alternative, Alternative 5, which removes the homes behind Aspen and reduces the home density from behind Via del Agua from 95 to 83. A settlement agreement reached with the developer further constrains the project to 80 units. Cielo Vista ingress and ingress will be provided off of Stonehaven/Via del Agua. The November 2008 Freeway Complex Fire burned this site down. This project lies just west of Esperanza Hills project.